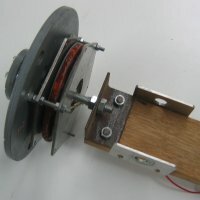 The hub was made from two 9mm disks of plywood. The bearings (10mm ID, 30mm OD, 9mm wide) were glued into centre of the plywood disk. To align the bearing with the disk the hole was bored over size and the disk and bearing placed on a horizontal flat piece of metal and fibreglass resin pored into the gap. The plywood disks ran surprisingly true. The two plywood disks were then spaced apart using six 6mm bolts and lots of nuts and washers. The washers were large enough to trap the edges of the bearings so they were held fast as well as being set in the resin. The axle was a piece of 10mm studding with nuts to lock the bearings in place. Adjusting all the bolts and nut to get the hub to turn without friction was near impossible but it served its purpose as a test. I would not suggest this as a practical working model. 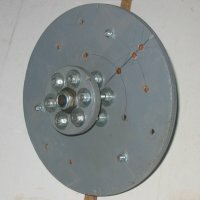 The blades are bolted to the front of the large disk and the alternator to the back. 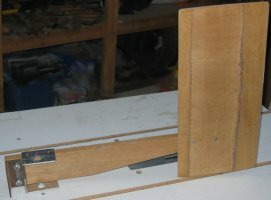 The body of the turbine was wood with a plywood tail. 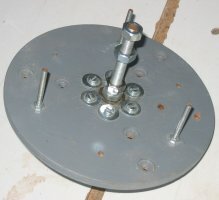 A section of steel angle is screwed to the front and the stud axle is bolted to this. The vertical bearings are pieces of sheet aluminium with holes cut out that loosely fitted over a length of vertical metal tube bolted to a wooden post. The cable was routed down the centre of the tube to the ground.